Rebbe Nachman of Breslov says (Likutei Moharan II:104) that the most important divine service of a Jew is that which is done in simplicity and innocence. Particularly, Hashem takes indescribable pleasure in the zemiros, the singing of a Jew on his Shabbos table. If I'm not mistaken, a Jew's singing of praises on the Sabbath is what makes the Sabbath, just like the King's nightingales in our parable are what really made the royal gardens. Therefore, we have the power to "make the Sabbath" by singing our praises to Hashem on the Sabbath table. May Hashem help us to sing our way to a day of endless Sabbath, the full redemption of our people Israel, speedily and in our time, amen. 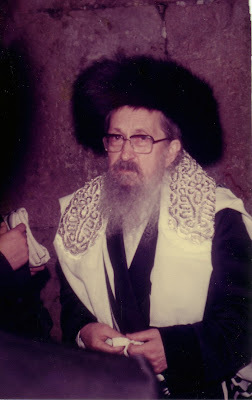 This Tisha B’Av will be the 192nd yahrzeit of Rebbe Yaakov Yitzchak, the Chozeh [Seer] of Lublin, who is one of the truly beloved figures of Chassidus. A disciple of the Maggid of Mezritch, he continued his studies under Rebbe Shmelke of Nikolsburg and Rebbe Elimelech of Lizhensk. After he moved from Lanczut to Lublin, thousands of Chassidim flocked to him, to savor his teachings and to be warmed by his saintly presence. REB SHLOMO CARLEBACH says: "The Chozeh of Lublin - the heart trembles! Everybody knows that from the time of the Holy Temple there was not a group like this, like the chevraya Kadisha of Lublin. The Rebbe of Lublin said about himself that he had the neshama [soul] of the prophet Yeshaya. He didn’t have mamesh [actual] prophecy because he lived in chutz la’Aretz [outside of the Land of Israel]. He had some 5,000 Chassidim who had ruach haKodesh, and thousands upon thousands of others, who were simple Jews. They once asked Rebbe Naftali Tzvi of Ropshitz why the Chozeh and his talmidim didn’t bring Moshiach. 'I’ll tell you the truth,' answered Reb Naftali, 'it was so good (by the Chozeh) that we forgot to bring him.' But the Chozeh always yearned to bring Moshiach. What Reb Naftali said was just a matter of humor." 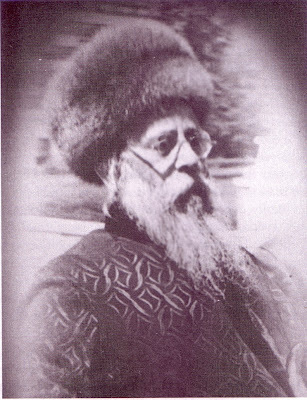 Rebbe Yaakov Yitzchak Horowitz of Lublin, who became known as "the Chozeh" only some fifty years after his passing, is known as the father of Polish Chassidus. Almost all the Polish Rebbes can trace themselves back to the court of the Chozeh. Besides the Ropshitzer, among his ardent followers were such Chassidic luminaries as Rebbe Yechezkel of Kuzmir, Rebbe Yaakov Yitzchak [HaYehudi HaKadosh - The Holy Jew/Yid], Rebbe Simcha Bunim of Pshischa, Rebbe Menachem Mendel of Kotzk, Rebbe Meir of Apta, Rebbe David of Lelov, Rebbe Moshe Teitelbaum of Uhel ["Yismach Moshe"], Rebbe Tzvi Elimelech of Dinov ["Bnei Yissaschar"], Rebbe Klonymus Kalman of Cracow ["Ma'or VaShemesh"], Rebbe [Sar] Shalom of Belz, Rebbe Yissaschar Dov Ber of Radoshitz, and many others. The present-day Chassidic dynasties of Ger [Gur], Satmar, Belz, Modzitz, Sanz, Bluzhev and many others, all had their origins in Lublin. He merited the 'title' of Chozeh, which means seer or visionary, due to his great intuitive powers. For example, he had the ability to discern a petitioner's character, his past deeds, and the root of his soul by glancing at his forehead. The Chozeh could look into the future. He could see, it was said, "from one end of the world to the other." He could see events taking place, far away from where he was sitting [see the last paragraph below as well]. The story is told of Rebbe Yissachar Dov Ber of Radoshitz , who said to his teacher, the Chozeh, "Show me one general way to the service of G-d."
His teacher replied, "It is impossible to tell people what way they should take. For one way to serve G-d is through learning, another through prayer, another through fasting, and still another through eating. Everyone should carefully observe what way his heart draws him, and then choose this way with all his strength." As a result of this story posted over a month ago on A Simple Jew’s blog, I commented: There's a great story about the Chozeh of Lublin's clock, that borders on this theme. Bli neder, I hope to post it for his yahrzeit, which is Tisha B'Av. Watch the space on my blog! It appears right below. This story appears in many versions, but I haven’t seen [or heard] a better one than the way Rabbi Michel Twerski of Milwaukee tells it. 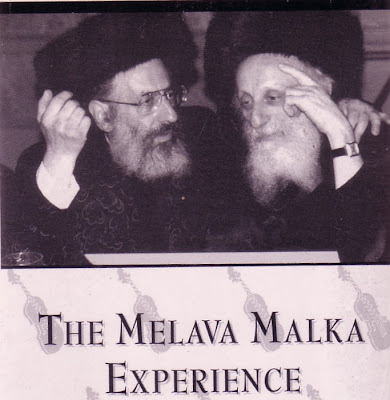 The following is my lightly edited transcription of the story, which appears on "The Melava Malka Experience" recording. When the holy Chozeh of Lublin passed away, all of his Chassidim found themselves in a time of extreme aveilus [mourning]. It seemed to them that there would be no one, nowhere, to whom they could turn, that would replace the giant who had served as their guide and inspiration for so many years. Most grief-stricken of all was his son, R. Yossele Tulchiner, who was in his own right a man of great righteousness, he was himself a tzaddik of great repute, and he could find no consolation. 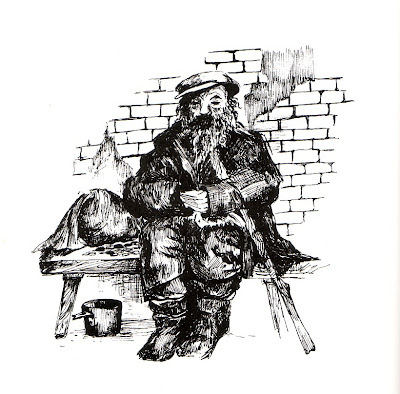 He remained behind in Lublin for many weeks, trying to find some place where he might comfort himself. At long last, he realized that he needed to move on. Before he left, he went to see if he might collect some of his father’s belongings, so that when he returned home he would have some physical mementos with which to comfort himself. He threw a number of articles into a bag – amongst which was a wall clock. It was kind of a cumbersome thing, but it was something that reminded him of the room in which his father, the Chozeh, had learned, davened and received his Chassidim. So he set out along the way, to return home to Tulchin. We must remember that R. Yosef, not unlike other tzaddikim of his time, was essentially destitute and penniless. And so he was very much dependent upon the goodwill of whoever happened to be traveling – that they might give him a lift in their horse-drawn wagon. Finally, someone pitied him, and as it turned out – as the Gemara says, "poverty follows the poor." This fellow who gave him a ride, had an open carriage. A number of hours into the trip, it began to pour – it was a deluge! They were soon soaked to the bone, and a cool breeze began to chill them. He knew that unless he found some haven, that he would catch the death of a cold. And so, he ran for the first shelter that he could find. He finally found an inn – the innkeeper was very hospitable and took him in, built a warm fire, offered him a warm drink, and something with which to cover himself in his discomfort. He spent the night there. The next day, the rain continued and he spent another day and night there. The innkeeper was no Chassid, and none of these things meant anything to him. So he searched through the bag. Finally, his eyes set on this clock. "This is really not worth it," he said, "but it’s the only thing you have that even approaches in value, so I’ll take the clock." Reluctantly but nonetheless gratefully, he surrendered the clock. R. Yossele left and continued on his way. Many, many years passed. 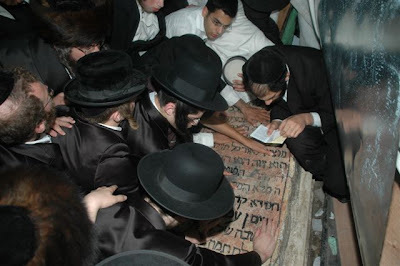 One of the Chozeh’s esteemed Chassidim, who was now a leader of a Chassidic community in his own right, [known as] the Saba Kadisha of Radoshitz, Rebbe Yissaschar Ber, was traveling with his Chassidim. As they were traveling, they sought a place to spend the night, and they found this particular inn. The innkeeper was again very hospitable and gave the Rebbe his finest room. The Chassidim did the best they could with the little bit of room that was left. Night fell, and everyone went to sleep. The proprietor of the inn went to bed. He heard sounds coming from the Rebbe’s room. At first he ignored them, but they became increasingly disturbing. The Rebbe was clearly marching around his room. Soon the marching turned into a dance. He could hear the Rebbe singing to himself and dancing. At first, he thought it would soon end. Ten minutes. Half an hour. An hour. Throughout the night, the Rebbe danced. Finally, early in the morning, the innkeeper knocked on the door and said, "Rebbe, all night you’ve been awake dancing – I heard you! What’s happening?" The Rebbe said, "I, too, would like to know what’s happening. 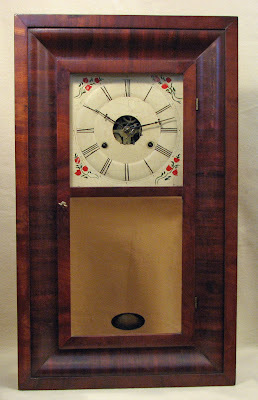 Please tell me – where did you get this clock – the one in my room?" The innkeeper replied, "There was once a traveler who couldn’t pay his bill. And he said that his father was a great Rabbi; I don’t remember the name. But some objects belong to him, and I claimed the clock in payment." The Radoshitzer said, "What did this traveler look like?" The innkeeper described him. The Radoshitzer called his Chassidim. "It’s clear to me that R. Yossele must have traveled this way after his father’s petira [passing]. And when he couldn’t pay his bill, he gave up the clock. I remember the clock well. When I used to go in to the Rebbe, the Chozeh, I would see that clock on the wall. I knew that this clock had to be the Rebbe’s!" "What gave it away?" asked the Chassidim. The Rebbe replied, "Every clock in the world, when it ticks, it’s depressing. Every tick signifies another second of life gone, spent, never again to be claimed. That’s how most of us deal with time. "But the Rebbe had a command and appreciation for time; that every moment to him was a moment closer to the Geula Shelaima, to bias Moshiach Tzidkeinu [the complete Redemption and coming of the righteous Messiah]. His clock did not tick with sadness or sorrow; it was not a mournful tick. It was positive – full of hope, not a tick of despair. The tick-tock of the Rebbe’s clock was one that marched towards the Geula Shelaima. "When I came, I wanted to sleep – I was tired! But that clock – it kept me constantly moving towards the Geula. How can you sleep when you have a clock that reminds you every moment that we are a moment closer to the Geula Shelaima? So I danced all night!" Rav Michel Twerski adds: This clock of the Holy Chozeh represents something that we learned about, something which has the capacity to do two opposite things: the Parah Aduma [the red heifer], which defiles the pure, and purifies the defiled. For all of us, life presents many opportunities. For some of us, they turn into problems. We look at them – another problem, another nail into our hide, another difficulty, barrier, obstacle; another cause for sorrow, sadness; another area to drain us of our energy. And because we take that attitude, it cripples us; it turns into a shackle which won’t release us. On the other hand, there are people who have very much the same kinds of challenges and tests. To them, they are opportunities, doors, gates – into bigger and better things – developing new strengths, insights; commanding new perspectives, and ways for us to be able to rise above the things that challenge our way in life. The same test – trial – tribulation; but attitude makes all the difference. For some of us, those tests are the "tick in the clock," which is a tick of despair, a sound of life wasted. For others, it brings us closer to our own Geula, to redeeming all of the potential and all of the resources in ourselves. Something else to bring out the kochos hanefesh [soul powers] that we have. It’s one move closer to our own personal Geula, and ultimately, through us, a contribution to the Geula Shelaima. Chazal tell us (Yoma 54b) that when the Roman general Titus burst into the Kodesh HaKodeshim while the Beis HaMikdash was being destroyed, the two Kruvim (Cherubim) on the Holy Ark were embracing each other. The Ritva, citing the R"i Migash, asks the following question: The Gemara, in Bava Basra 99a, states that the Kruvim served as an indicator of Am Yisrael’s relationship with Hashem. If we fulfilled Hashem’s will, they faced each other, and if not, they faced apart. Amazingly, at the moment the Beis HaMikdash was burning, the ultimate punishment for our sins, the Kruvim were not only facing each other, but they were actively embracing! Yet how could this be? The Shabbos before Tisha B’Av is referred to as Shabbos Chazon, the Shabbos of Vision, after the beginning of the Haftara for Parshas Devarim, which is taken from Isaiah. Rav Tzadok HaKohen (Pri Tzaddik, Devarim 13) asks why, and quotes a famous Midrash on the Book of Eicha. According to this Midrash, on Tisha B’Av, after the Churban, Moshiach is born. This is brought about through the merit of the teshuva that Am Yisrael did (which unfortunately came too late) in response to the destruction. For this reason, the Kruvim were hugging each other, because at this moment of teshuva, Am Yisrael were transformed from sinners into tzaddikim, doing the will of Hashem. Rav Tzvi Elimelech of Dinov, in Bnei Yissaschar: Av 3:1, quotes the Mezritcher Maggid’s startling response to the same question about the Kruvim hugging each other: "A man is obligated to be with his wife before departing upon a journey." This concept is also discussed in the laws of Taharas HaMishpacha (the laws of family purity). Since a couple, before an impending separation, feels great love and yearning for each other, there is a special obligation of mitzvas ona, marital relations. Here as well, as Am Yisrael and Hashem prepare to be separated by the journey of the exile, intense emotions of yearning and love overcome the prior negativity in their relationship, enabling the Kruvim to embrace amidst the flames of the Churban. The Lubavitcher Rebbe explained this concept in Likkutei Sichos. In chitzoniyus (external reality), we see flames, destruction, death, and exile. However, in pnimiyus (internal reality), galus is no less than the first stage of the next geula. Every step towards exile is actually one step closer to returning, bringing us one day closer to Moshiach and the Third Temple! This ultimately true inner reality is only really evident in the world’s most "inner" place, inside the Kodesh HaKodeshim. Here, the Kruvim are embracing. Tisha B’Av is the day of the most powerful expression of the yearning, longing, and desire between Am Yisrael and Hashem. Such love and passion is aroused, states the Bnei Yissaschar, that it facilitates the birth of Moshiach, the world’s "highest" soul. Only from the depths of destruction can there arrive a yearning that is powerful enough to lead us to full redemption. This is a manifestation of the well-known Chassidic concept (very prevalent in Breslov Chassidus) of Yerida Tachlis Aliya, "in the very descent, ascent is already manifest." An important rule in each of our personal lives, this concept teaches us that churban and galus contain the sparks of teshuva and Ahavas Hashem, paving the way for Geula and Moshiach. On the day he left the world (the 9th of Av, 1815), the Chozeh prophesied that 100 years from that day, the Russians would lose their reign over Poland. And so it was to the date: on July 20, 1915 (which was the 9th of Av), the Austrians conquered Lublin. In the year 1916, during World War I, the Chozeh's prophecy was noted in the Polish newspapers, in the following report: "The Jews of Lublin recounted that Rebbe Yaakov Yitzchak Horowitz wrote in his last will and testament that 100 years after his death, Russia would cease to rule over Lublin. He passed away on Tisha B’Av 1815; and last year, on Tisha B’Av 1915, Austria conquered Lublin." Zechuso yagein Aleinu v'al Kol Yisrael - May the Chozeh's merits protect us all! The Nesivos Shalom – Why Are We Mourning? R. Brazovsky also authored many volumes of his own teachings, including the seven-volume Nesivos Shalom and many smaller works on educational issues, marital harmony and other issues. One distinguishing feature of those works is R. Brazovsky's practice of deriving practical moral and ethical teachings from verses using traditional Chassidic methods of interpretation. R. Brazovsky served as the Slonimer Rebbe from his father-in-law's death in 1981 until his own passing in the year 2000. He is succeeded by his son, R. Shmuel. "The entire process of creating the renewed edifice of the Holy Temple, and the redemption from the Exile of the Divine Presence, occurs by means of the mourning and the prayers of Israel. It is this (energy) that draws down the building of the Holy Temple. (…Their personal) anticipation of Salvation is the force which draws it down. From this the actual building of the Holy Temple occurs." Today is 4 Menachem Av, the 66th yahrzeit of Rebbe Ben Zion Halberstam ZT”L, the second Bobover Rebbe (1874–1941). He was born in Bikofsk, Galicia in 1874 to his father, Rebbe Shlomo Halberstam ZT”L (1847–1905), the first Rebbe of Bobov. He was also a great-grandson of the Divrei Chaim of Sanz (1798–1876). At the age of thirty-one he succeeded his father as Rebbe. Rebbe Ben Zion led the Bobover Chassidim from 1905 until his murder near Lvov by the Nazis on 4 Av 5701/1941. Under Rebbe Ben Zion's leadership, Bobover Chassidus was almost alone among Chassidic groups in its focus on youth, and the network of 50(!) yeshivos which Rebbe Ben Zion founded recaptured the hearts and minds of thousands of youth who were left spiritually devastated by the first World War. He wrote a commentary on the Torah called Kedushas Tzion. Rebbe Ben Zion was succeeded by his son, Rebbe Shlomo Halberstam ZT”L (1907–2000), who rebuilt Bobov in the United States. Besides his tremendous talents as a Rebbe, leader of his Chassidim and a visionary educator of Bobover youth, Rebbe Ben Zion was very gifted musically. He composed scores of niggunim, many of which have been recorded by Bobover Chassidim as “Shirei Zion.” Besides the Rebbes of Modzitz, Rebbe Ben Zion of Bobov was perhaps the best composer amongst the Chassidic Rebbes in the 20th Century. 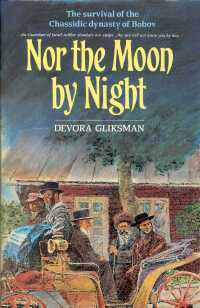 A wonderful book, Nor the Moon by Night [Feldheim, 1997], has been written about the Halberstam Family, by Devora Gliksman. The following story has been excerpted from this book and adapted for my blog. Shaul Hutterer lowered his eyes modestly. The budding talmid chacham [Torah scholar] and diligent student was often called upon to begin the singing. Not only was his voice sweet and clear, the devoted Chassid sang his Rebbe’s niggunim with the same feeling and expression as the Rebbe himself. In thunderous harmony, the entire assemblage raised their voices as one. The Rebbe swayed to the music, his eyes closed, his expression serious. The song ended. The Rebbe sat in silence. Everyone waited for a movement or a signal, something to tell them what to do. Around the tables, the guests sat spellbound as the haunting melody beckoned them to exult in their heritage as Moshe Rabbeinu had exulted in his. Slowly, soothingly, the tune trailed off. Rebbe Ben Zion looked lovingly from student to student, communicating his care and concern for them as individuals, before encompassing the assemblage in a warm, sweeping gaze. And then he began to speak. ''The niggun you just heard is no ordinary melody. It was inspired by an incident that occurred just last week''. Intrigued, mystified, and always eager for a good story, the bachurim inched a bit closer, as the Rebbe told his tale. The postman delivered boxes to the yeshiva. Innocuous, ordinary looking boxes. Shipments of sefarim regularly arrived in such plain brown boxes and these looked no different. As was his practice, Rebbe Ben Zion began opening them to verify their contents. With a pocket knife, he cut through the wrapping and reached inside for the uppermost sefer. Disbelieving, he stared at the book, his face pale, his hands trembling. Dropping it like a hot coal, he ran to the Rosh Yeshiva, R. Mendele Rottenberg. "R. Mendel,'' he called, ''you must come quickly. I have something terrible to show you.'' R. Mendele followed unquestioningly as Rebbe Ben Zion led him to the other room. Motioning to the Rosh Yeshiva to help him with the boxes, he started down the hallway. Neither spoke until they reached the fireplace near the office. Then R. Mendele began vigorously chopping wood as the Rebbe built the fire. Once the flames had gained strength, the Rebbe threw in one book at a time, watching each deteriorate into a mass of ashes. When he finished, he tossed the box, the wax that had sealed the box, the wrapping paper, and the string into the pyre and proceeded to the next box. Finally, when every book, every scrap of string and packaging, everything that might have had contact with the idolatrous writings of a heretic was aflame, the two men stood silently and watched, not moving from their places until the embers snuffed out and only ashes remained. Zechuso Yagein Aleinu v'al Kol Yisrael - May the Kedushas Tzion's merits protect us all! Today, 29 Tamuz, is the 902nd yahrzeit of Rashi, Rabbi Shlomo Yitzchaki of Troyes, France (1040-1105). Rashi's greatness as a commentator is unparalleled; his words are studied daily by students and scholars, in the yeshiva, seminary and in the Jewish home. Rashi’s Torah commentary was the world’s first dated book printed in Hebrew and was widely distributed. His commentary on the Torah is included in virtually all editions of the Chumash (Pentateuch). In a clear and concise style he gave both the simple meaning of the text and its homiletic interpretation, based on Talmud and Midrash. He explained the text phrase by phrase, often commenting on grammatical anomalies and translating difficult words into Old French. Besides his Torah commentary, he also wrote a commentary on the Prophets and Writings. Rashi's work has become a part of Jewish life, the favorite commentary of the common man and scholar alike. A measure of Rashi's greatness is the fact that 200 books have been written, probing his words. His commentary to the Talmud is a masterpiece of clarity and brevity. Without it, the Talmud would be a closed book. Rashi gently takes the student by the hand, guiding him through the maze of complex forms of reasoning, obscure concepts, and knotty legal arguments. In clear and simple Hebrew, he clarifies the Talmudic text, almost line by line, anticipating the difficulties the student will encounter. As a special treat to Heichal HaNegina readers, you can view a one-hour video of Rashi’s life, in animated form, here. The language of this video is Hebrew. The video can be obtained from Rabbi Berel Wein's website, in English, Hebrew or Russian. The Significance of Miriam's Well - UPDATED! Three great providers arose for the people of Israel--Moshe, Aharon and Miriam--through whom they received three great gifts: the well, the clouds [of glory], and the manna. The well was in the merit of Miriam, the clouds in the merit of Aharon, and the manna in the merit of Moshe. When Miriam died, the well was removed, as it says, "And Miriam died there..." and, immediately afterward, "And there was no water for the congregation." The well then resumed in the merit of the other two. Why am I discussing this now? An amazing discovery has taken place today, which received very little coverage, except on some Hebrew news websites. (IsraelNN.com) The spot of Miriam's Well, as identified by the 16th-century Kabbalist sage Rabbi Yitzchak Luria (also known as the Arizal), who lived in Tzfat, has been found once again. Talmudic tradition has it that the source of water for the Israelites during their 40 years in the desert was the Well of Miriam, and that when they arrived in the Promised Land, the Well was "deposited" somewhere near Mt. Carmel or in the Kinneret [Sea of Galilee]. The Arizal identified the exact spot of the Well as being near or between certain ancient pillars in the Kinneret. 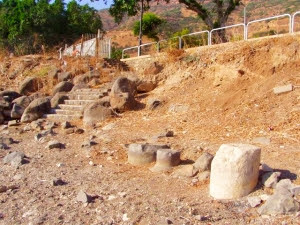 These pillars have now once again been found, just south of the Tiberias Municipal Beach. Much more detail, in Hebrew can be found on the Hebrew NFC news website, which broke the story. This Well traveled with the Jewish People throughout the forty years of wandering in the wilderness. When we reached Eretz Yisrael, the Well was hidden in the Kinneret. This tradition was passed on from generation to generation, but the exact location was known to but a very few people. When the Arizal [Rav Yitzchak Luria] came to Tzfas in the 16th century, he identified many unknown or forgotten locations, such as the gravesites of the Chachmei HaMishna – the Tannaim, authors of the Mishna. He also identified the exact location of Miriam’s Well in the Kinneret, which was described, albeit vaguely, in a sefer called "Shaar HaGilgulim [Gate of the Reincarnated]." Modern-day research, led by an archeologist named Yossi Stefansky and Rabbi Yisrael Hertzberg, has led to the discovery of another lesser-known sefer, called "Naggid U’mtzaveh [Tell and Command]," by R. Yaakov Tzemach. Written 60 years after the passing of the Arizal, it gives a precise location of the Well, as described by Shmuel Vital, son of Rav Chaim Vital who was a talmid of the Arizal and had once accompanied him to the Well [see story below]. The description revealed that the Well was to be found between two pillars of an ancient synagogue, apparently from the Talmudic era. The tradition of this location, as mentioned, was known to locals, and even recorded in more recent sefarim, such as the sefer Chibas Yerushalayim [Love of Jerusalem] by R. Chaim HaLevi Horowitz in 1844. 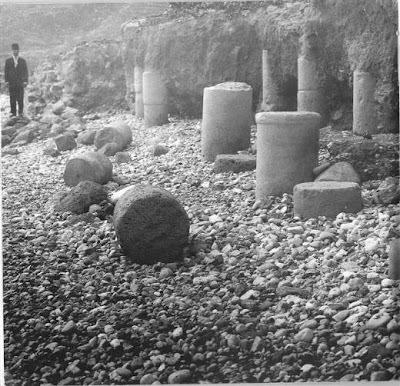 The black and white picture, also found by Stefansky in the archives of the Antiquities Authority in Jerusalem, clearly indicates the pillars as they stood about 100 years ago. Just a few hours ago, Arutz Sheva released this in English, where you can read the rest of the details. The only other blogger who seems to be covering this is Nava at her Dreaming of Moshiach blog, who also reveals some amazing info! "There were three good shepherds/providers that were given to the Jewish people: Moshe, Aharon, and Miriam. And three good gifts were given in their behalf: the Manna in Moshe’s merit, Seven Clouds of Glory in Aharon's merit, and a [mobile] Well in Miriam's merit." (Taanit 9a, Zohar III 102b) Throughout their 40-year sojourn in the desert, they ate wondrous manna, were surrounded and protected by seven Clouds of Glory, and drank water from a miraculous Well. Thus were their basic needs of food, water, and shelter provided for in the desert. A person may ingest the ingredients of life, but these will not vitalize him without the fluids that course through his body. The food swallowed by the stomach, the oxygen drawn in by the lungs, must now be transported through the body's canals and made to saturate its every cell. Therein lies the spiritual significance of Miriam's role as Israel's provider of "water." Miriam first appears in the Torah (see Midrashim and commentaries on Shemos 1:15) as a children's nurse: one who distills adult food for the consumption of a child; one who trains and educates a growing human being, filtering the stimuli of an adult world for his maturing mind; who processes the raw materials of life to meet the specific needs of her charge's age and phase of development. Miriam's Well is the vital fluid of Israel's spiritual life, the water that inculcates them with the knowledge and identity her brothers provide. The waters of Miriam transport and apply the nutrients of Torah and the abstractions of faith to each individual, on his or her particular level. The Well of Miriam was a source of water -- which does not, in itself, nourish the body. The principal function of water is to act as a medium to carry food to all parts of the body. …there is that aspect of Torah that carries both the "external protection" and the "nourishment" to all Jews -- like the water of Miriam's Well. Water has the essential characteristic that it descends from high places to low places. The Torah, too, descends from the heights of lofty, Divine, profound wisdom to become clothed in the actual letters and words of the Written Torah and Oral Torah, thereby becoming available to everyone. The Well of Miriam was for drinking and also for washing clothing. Water serves two purposes. One is for drinking, when it becomes part of the person's life force. The second purpose is for cleansing the body and clothing. The skin itself is also clothing of the inner dimensions of the body. The fact that water is necessary for washing, is the way to meditate on the Chotam Hamithapech. The water of the Well of Miriam, in addition to being used for drinking, comes to wash the clothing of the Jewish People. … throughout the forty years of wandering, a miraculous Well accompanied the Israelites in the merit of Miriam. The history of Miriam's Well is not written explicitly in the Torah text but only allusively. The allusions are brought out in the Aramaic Targum and in Midrashim brought by Rashi on certain verses in our parsha -- such as Bamidbar 20:10-11 and 21:15ff. This Well of the waters of inspiration accompanied the Israelites on all their journeys in the wilderness and provided water for the camp at each of their stopping places. When Miriam died, it disappeared, but it returned in the merit of Moshe and traveled with the Israelites on the last stages of their journey through the wilderness. …The parsha relates that the miracles of the crossing of the Arnon were comparable with the miracles of the crossing of the Reed Sea (Bamidbar 21:14ff.). The Emorites were waiting for the Israelites in caves in the gorge below, but the two sides of the gorge miraculously came together, allowing the Israelites to walk safely above. The Well of Miriam, which traveled with the Israelites, flushed the blood of the dead Emorites out of the gorge so that the Israelites could see the miracles performed for them. Thus, forty years after the Generation of the Exodus had sung to G-d when they came up from the Reed Sea, the Generation of the Conquest sang again as they witnessed the first miracles of the conquest. "That was the Well of which Hashem said to Moshe, gather the people and I will give them water. Then Israel sang (lit. WILL SING) this song: Arise, O Well.!" (Bamidbar 21:16-17). When they entered the Land under Yehoshua (on 10 Nissan, anniversary of the death of Miriam), the Well also entered the land. It traveled to the Kinneret (Sea of Gallilee), where it is said to be visible from mountains to the east as a kind of "sieve" on the surface of the sea. From the depths of the Kinneret, the Well is said to feed the waters of Israel's most important water reserve. The conquest of the Land depends upon Miriam's Well -- the Well of Torah insight and inspiration. In addition, the Me'am Loez explains that the "Well of Miriam" was more to the Israelites than just their source of water. When the leading clouds came to a stop it indicated to the nation that they should make camp. The arrangement of the camp as detailed in the beginning of the Book of Bamidbar was deliberate and divine, and directed initially by the Well, which would move to the very center of the camp, marking the position of the Tabernacle. The Well then overflowed and created a canal system that delineated the placement and boundaries of each tribe within the desert encampment. With Miriam's death, the nation's source of water ended... The Meam Loez explains that the "Well of Miriam" was much more than their source of water. When the leading clouds came to a stop it indicated to the nation that they should make camp. The arrangement of the camp as detailed in the beginning of Bamidbar was deliberate and divine. The Midrash says that the Well of Miriam would move to the very center of the camp, marking the position of the Mishkan. It then overflowed and created a canal system that delineated the placement and boundaries of each Tribe within the desert encampment. … [As the Jews prepared to cross the Jordan to go into Eretz Yisrael], along with the division of labor between the tribes would come an increased sense of independence from G-d. It would take greater sophistication and sensitivity to see the constancy of G-d's loving concern as not being any different than when it was in the desert. Therefore, the delineated differences between the tribes highlighted by the miracle of Miriam's Well, was of greater symbolic significance than ever before. Yet, Miriam died and the Well ceased to provide water. The individual tribes were left alone to consider their own placement, divisions, and responsibilities. The Well did not abandon the nation of Israel even after their entrance to the Land of Israel, as opposed to the Manna and the Clouds of Glory; in fact, it continues to contribute from its wondrous powers until this day. When they entered the Land under Yehoshua (on 10 Nissan, the anniversary of Miriam's death), the Well also entered the Land, where it became hidden. Rabbi Chaim Vital describes his initiation into the Arizal's new approach to Kabbalah as follows: "When I [first] came to my teacher of saintly memory [the Arizal] to study this wisdom under him, he was about to leave for Tiveria. He took me with him. We boarded a boat, and as we were sailing [across the Kinneret] at a point opposite the arches of the Old Synagogue of Tiveria, my teacher dipped a cup into the water and gave it to me to drink. He told me that now I would be able to grasp this wisdom [the teachings of Kabbalah] for I had just drunk water from the Well of Miriam [which is buried in the Kinneret]. From that time on I began to enter the depth of this wisdom." According to one source, the Well sank into the Sea of Galilee: "It happened that someone who suffered from boils went down to immerse in the waters in Tiveria; it was an opportune time, and he saw Miriam's Well and washed in it and was healed". (Vayikra Rabba, 25:5). These healing effects are also mentioned [Hebrew link] in the Midrash Tanchuma, Parshas Chukas. Even in our day and age, "some have a tradition to draw water [from a well] Saturday night because Miriam's Well supplies all the wells each Saturday night, and one who does so and drinks will be cured of illness" (Kol Bo, Orach Chaim, 299:10). Indeed, Miriam's Well is said to feed the waters of Israel's most important water reserve nowadays, the Kinneret [Sea of Galilee], while hidden in its depths. We all know the power of song. When we hear a moving song, whether of sadness or joy, it alters our mood. And depending on our feelings, we will seek out a particular song. Indeed, when happy we will spontaneously break out in song. It's as if we literally cannot contain ourselves, and must break out of our limitations. Let's analyze the two movements, the two ways songs affect - or express - our emotions. The first elevates us. Such a song expresses a longing, a desire, a compulsion to get beyond ourselves. Often such songs are simple - melodies, tunes, wordless refrains. There is a sweetness about them. Even when there are words, they speak of another, of an absorption of the self in something higher, of an abandonment of ego, the material, of a removal of physical limitations and a realization of the spiritual. Many Chassidic niggunim (wordless tunes) express this longing of the soul. Jewish songs with words also emphasizes the emotional power of positive, uplifting music; the artists combine words of Tehillim, verses from the Torah, or allusions to them, with soul-stirring melodies. And this leads inevitably to the second type of song. Here there is a bitterness, a recognition that we are not yet united with G-dliness, that we still reside - must reside - in the physical world. These are songs set, for example to the words of Tehillim 42: "As the hart cries out in thirst for the springs of water, so does my soul cry out in thirst for You, O G-d. My soul thirsts for G-d, for the living Almighty; when will I come and appear before G-d?" If one type of song expresses a desire for closeness, a longing for negation of the self in an ecstatic inclusion of the soul within G-dliness, the other recognizes the distance between ourselves and G-d, how immersed in the mundane we truly are, how much the physical demands from us. The song cycle reflects the rhythms of time, the moments and movements of the year. Further, this emotional cycle of ascent and descent and further ascent has a parallel in the soul's journey, and its Divine Service. In Hebrew it is called ratza v'shav - a transcendent elevation and an imminent return. It embodies a fundamental concept, namely that every descent leads to a higher ascent; indeed, the higher ascent cannot be achieved without the descent. Just as our songs cycle through the bittersweet, from songs of loss and separation to songs of joy and union, so the Jewish people have cycled through stages of occlusion and revelation, of ignorance and knowledge, of exile and redemption. In each mini-cycle the energy of descent fuels a greater ascent. And ultimately, our songs of loss and separation will energize the ultimate song of joy and union, a celebration of the final Redemption, as it says in Tehillim [126:2]: "Then our mouths will be filled with laughter, and our tongue with joyous song." "Every Tear and Every Sigh is Another Element in the Building"
Yesterday we entered the Three Weeks, the period of mourning for the destruction of the First and Second Beis HaMikdash, the Holy Temples in Yerushalayim, Ir HaKodesh [the Holy City of Jerusalem]. While our listening to music is limited, we can devote our thoughts to what we can do to build the Third Temple, may it be speedily in our days. It is with great pleasure that I bring you the following article from Aish HaTorah's wonderful website, from an old and dear friend, Rabbi Yehuda L. Oppenheimer [pictured above]. We know him affectionately as "Lenny" or "Reb Len". 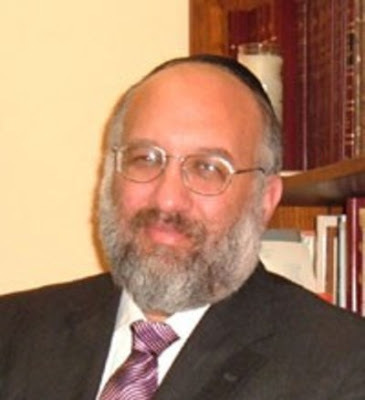 We are also delighted with his recent appointment as the Rabbi of the Young Israel of Forest Hills [Queens, NY], where he succeeds Rabbi Feivel Wagner, of blessed memory. I have lightly edited the article for my blog, including the added emphasis on certain parts. 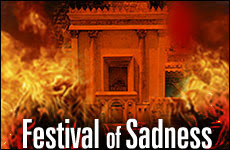 Unless things change a whole lot in the next few weeks, we will once again be going through the days leading up to and including Tisha B'Av, the Ninth Day of the Month of Av, the saddest day on the Jewish calendar. Year after year, we reflect on our condition in the Diaspora, and what this long, seemingly endless exile is supposed to teach us, while awaiting the long sought for Redemption. There is an interesting anecdote recorded regarding a meeting between the prophet Yirmiyahu [Jeremiah] and the famous Greek philosopher, Plato. Yirmiyahu was mourning the destruction of the First Temple in Jerusalem, and Plato engaged him in conversation. Impressed with Yirmiyahu's great wisdom, Plato asked him, "I do not understand how a Sage of your stature can weep so bitterly over something that is over and done with. Surely, what is past is finished with, and your concern now ought to be solely with the future, and how you can influence it. What possible use can there be in all of this weeping?" Yirmiyahu answered, "I cannot give you a proper answer to your logical question, for you will not understand it." Was Plato not right? And surely now, 2500 years later, is it not time to focus on the present and the future, and to let bygones be bygones? Can we never forget? Can we never forgive? After all this time, how can we spend three weeks of every year going into greater and greater mourning, culminating in a day of fast and sadness? In fact, one of the great blessings that G-d grants us is the ability to forget painful memories. "G-d has decreed about a deceased person that they should be forgotten from the heart" (Sofrim 21). If it was not possible to forget, if the pain of losing a close relative or friend remained always as immediate as when the loss first occurs, we would be immobilized, unable to cope with life. It is a blessing that while we always carry a memory of a departed loved one, we are able to remove the pain of the loss from the forefront of our consciousness. Nevertheless, this general rule does not hold here, as expressed by the famous verse in Psalms, "If I forget you, O Jerusalem, let my right hand be forgotten!" We are bidden never to forget! The Sages, by instituting all of the laws surrounding these Three Weeks, made sure that at least during one long period of the year, and several other fast days year-round, not to mention the requests in our thrice-daily prayers, that we would constantly remember and never forget to mourn for Jerusalem. The Slonimer Rebbe, Rabbi Shalom Noah Berzovsky, zt"l, wrote a fascinating essay on this subject, in which he noted that central to Tisha B'Av is the idea that we are not to make our peace, ever, with the fact that the Holy Temple, the Beis HaMikdash, was destroyed. To never allow ourselves the thought that we accept the post-Temple world as the new, normal, permanent reality for us as Jews. The Temple in Jerusalem was destroyed for many reasons, some more well known than others. But that was never meant to be its final disposition. The day that we stop hoping that the Beis HaMikdash will be rebuilt is the day that its destruction will really be irreversible. This is such a basic thought that it ought to permeate all of our concerns in life. We struggle with our problems, with our kid's education, with our personal growth, with financial problems, existential problems; we look at the communal scene and the national scene both here and in Israel. We listen to the pundits and "wise men" who have this solution to intractable problems or who point to that occurrence to explain the crux of our quandaries, and we forget that the main problem is Exile -- our distance from G-d and his Holy Temple in Jerusalem. That no matter how many problems we solve here in America and Israel, and regardless of how much we grow in our spiritual lives as Jews, we will have a huge gaping hole in our spiritual lives as long as "we have been exiled from our land… and we cannot fulfill our obligations in your great and holy House..." [from the Musaf prayer of Shalosh Regalim, (Festivals)]. Why are so many Jews distant from their spiritual roots? Why are there so many terrible, endless problems between groups of Jews? How are we ever going to be able to resolve the great issues that divide us, when those matters are based on such fundamentally different outlooks on what the Torah is, what it means to be Jewish, the nature of our Jewish obligations, and how flexible can we be about adapting them for modern times? What will it take to allow myriads of Jews who have no idea of the beauty of Shabbos, keeping kosher, learning Torah, and Jewish living to even have a real glimmer of what they are missing? How will the great problems surrounding the Land of Israel ever be resolved? When we will be able to always feel the indescribable joy of being close to G-d without the inner contradictions and pain and difficulty, and existential loneliness that we so often feel in our spiritual quest? Our aching longings to reunite with G-d and rebuild the Temple are the building blocks of the eventual edifice. Although in many ways Judaism teaches that what one does is more important than what one thinks or believes, it is nevertheless true that "the longing to perform a mitzva, or to engage in a spiritual pleasure, is even greater than the pleasure itself." The active awaiting of its rebuilding, the tears shed over its absence -- the effort not to assimilate into the surrounding culture and its alien values, but rather to strive to retain our uniquely Jewish selves -- these are what will eventually bring it back. Every tear shed and every sigh over its absence is another element in the building. Thus, says the Slonimer Rebbe, the period of the Three Weeks between the 17th of Tammuz and Tisha B'Av are a period of crying, but a positive period: a crying that is part of the rebuilding process. A cry of hope, of longing for a better future -- an expression from the depths of the soul that we will never be satisfied and complacent in our spiritual quest until we have achieved total Teshuva (repentance), back to the closeness with G-d that once was and is still possible. We must certainly face life with a happy, confident attitude. We must take time to enjoy our growth, to celebrate our Jewishness, and to sing with the joy of being fortunate to be engaged in building our spiritual lives inwardly, as well as in our families and communities. But we must also take the time to mourn a little inwardly; about all the potential that is there, that is not yet being fulfilled. Only thus will we continue to grow, and look forward to the day that our inner sanctuary will be fully built, heralding the time of Moshiach, speedily in our days. Author Biography: Rabbi Yehuda L. Oppenheimer is the recently appointed Rabbi at the Young Israel of Forest Hills, NY, after serving in Jewish Outreach for many years in Portland, Oregon, where he and his wife Lonni helped several aish.com contributors reconnect with their Jewish roots while growing a spiritual community. A small glimpse of the crowd of literally thousands who were at the Ohr HaChaim's gravesite last night. Even more are going today! Today is the 15th of Tammuz and the 264th yahrzeit of Rabbi Chaim ibn [ben] Attar, better known as the Ohr HaChaim HaKodesh. Rabbi Chaim ben Attar was a Torah commentator, Kabbalist, and Talmudist. His sefer Ohr HaChaim is a famous commentary on the Torah, which merited to be included together with the commentaries of the Rishonim like Rashi, ibn Ezra, and the Ramban, in the Mikraos Gedolos. Much of what follows has been translated from the parsha sheet "Shimu us’chi Nafshchem", taken from the Nehora website, and from this week’s [June 27] English HaModia. IN THE YEAR 5499 (1739), Rav Chaim ben-Attar decided to realize his life’s dream: to make aliya to the Holy Land. As he writes in the introduction to his sefer Ohr HaChaim, "Since Hashem has enlightened me, there is nothing else to do but to arise and go to the place I’ve thought of - the place of the Shechina [Divine Presence], the exalted, beloved city…I girded my loins, endangered myself greatly, until Hashem brought me…"
Rav Chaim’s trip was fraught with travail, and more than once he was suspended between life and death. But he also experienced great miracles every step of the way. When the ship he was traveling on was in the midst of the sea, suddenly the sky changed unrecognizably. The white clouds slowly disappeared, giving way to dark, black clouds, which covered the entire horizon. The sea became gradually rougher. The white-foamed waves grew higher and higher, and then suddenly subsided. The ship was tossed about the stormy sea, rising and falling with the waves. The passengers were convinced that it was only a matter of time before their ship would be torn asunder and sink. Rav Chaim did not lose control, but prayed that Hashem would deliver him from his plight. He hurriedly wrapped his tallis, tefillin and his precious writings - his chiddushei Torah - in a sealed container. Suddenly, a burst of thunder shook the entire area. The planks of the ship began to come apart, and the screams of the passengers combined with the noise of the ship’s breakage. The passengers were all cast into the stormy waves of the sea. Miraculously, a thick plank of the ship passed in Rav Chaim’s direction. He hurriedly swam towards it and climbed onto it, and after many difficult hours on the stormy sea, he was cast onto the shores of a desert land. Although his strength was sapped, his mouth never stopped uttering praise and thanks to the Creator for his salvation. AFTER A SLIGHT RECOVERY, he began to make his way through the desert, without even knowing where it would lead. He placed all his trust on Hashem that he would land up in the right place. As he slowly made his way about, the roar of a lion suddenly reached his ears, coming from a nearby forest. Gazing upwards, he saw the beast galloping towards him. Rav Chaim then looked up to Heaven and said, "Master of the Universe! Just as you saved me from the stormy sea, please deliver me from the jaws of the lion!" 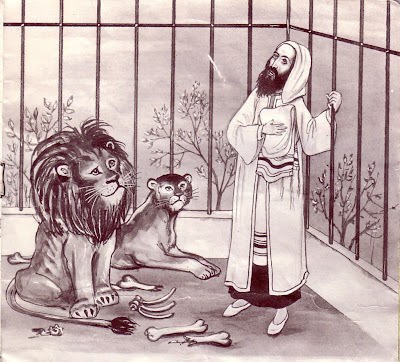 (Actually, an illustration from another famous Ohr HaChaim story, "Tzaddik in the Lion's Den," but it applies here as well). The speeding lion stopped dead in its tracks, looked at the tzaddik with dreamy eyes, and then turned around and went back into the forest. Relieved of his distress, Rav Chaim again offered a prayer of thanks to the Creator for this wondrous miracle. 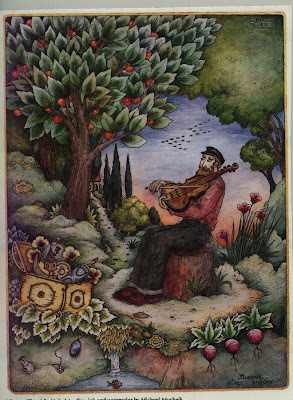 FOR SEVERAL DAYS, Rav Chaim wandered around, sustaining himself on plant life from the forest. Eventually, he came upon a hideout of a gang of thieves. Seizing him, the thieves brought him to their leader, who recognized Rav Chaim as a former master and teacher of his, from Morocco. "Don’t you recognize me?" he asked Rav Chaim. Identifying himself, he told Rav Chaim how he left the Beis Medrash [study hall], and eventually sunk to the lowest level - that of a thief. "Ah, now I know," said Rav Chaim, "why I had to endure such an arduous and perilous journey. It must have been Divinely ordained that I meet you, to help you return to the good way." Rav Chaim held a lengthy, heart-to-heart discussion with his former talmid, convincing him to leave his evil ways and return to the good. His efforts bore fruit, and the leader of the thieves left the gang in order to travel with the tzaddik. They eventually arrived in Livorno, Italy, a large city with a notable Jewish community in those days. THE JEWS OF LIVORNO greeted Rav Chaim very warmly and respectfully. They spared no effort at making his stay in their community as pleasant as possible. They were hoping that Rav Chaim would stay and settle in their town. They helped him publish two of his sefarim - "Pri Toar", and his famous commentary on the Torah, the "Ohr HaChaim". The latter sefer became so famous that the tzaddik was called after it. In Livorno, the Rabbi Chaim raised large sums of money for publishing his books and establishing a yeshiva in Eretz Yisrael. With thirty followers he arrived in Eretz Yisrael, four days before Rosh Hashana 5502 (1742), and settled in Acco. Rav Chaim and his students spent Yom Kippur in the cave of Eliyahu HaNavi [Elijah the Prophet] on Mount Carmel (Haifa), where they all felt a great sense of holiness and witnessed seeing a great light at the spot where according to tradition Eliyahu used to pray. The holiday of Purim was spent in Tzfas and Meron, where a great deal of time was spent studying the holy Zohar. They later moved to live in Peki'in for a few months. On the 15th of Elul 5402 (1742), Rav Chaim finally arrived in Jerusalem with his group. On that day, the Baal Shem Tov told his students: "Today Moshiach ben Yosef entered Yerushalayim." Rav Chaim immediately established a yeshiva called Knesses Yisrael and a second secretive yeshiva for the study of Kabbalah. One of his new students was Rabbi Chaim Yosef David Azulai (the Chida), who at that time was only 18 years old. The Chida later wrote that as profound as the Ohr HaChaim’s written works were, "they revealed but a tenth of his wisdom…and wherever he went, an aura of holiness enveloped him." Unfortunately, it was only a few months later and Rav Chaim was on his deathbed. The best doctors had been called in to treat him, but to no avail. In a short while he would leave this world. His wife approached the bed. With tear-swollen eyes, she cried, "When you leave me, I will be all alone in the world. Who will support me? What will become of me?" After the Shloshim [30-day mourning period], a wealthy merchant from Constantinople appeared in Jerusalem, seeking directions to the home of Rav Chaim. "Please sell me the tefillin the tzaddik prayed with," he begged Rav Chaim’s widow upon his arrival. "I’ll give you 300 ducats [golden pounds] for them (an enormous sum in those days, enough to support his wife for life)." "I’ll sell them to you," she replied, "only if you will treat them with the utmost sanctity." She then delivered the details of Rav Chaim’s warning. The man agreed, accepting the tefillin with extreme reverence. Arriving home, the man indeed treated the tefillin with extreme care and sanctity, never taking his mind off them - even for a moment. From the time he began to wear these tefillin, he experienced an arousal of holiness he never had before. The prayers left his mouth with fervor and great feeling. ONE DAY the wealthy man was in the beis midrash, praying with these special tefillin on. Suddenly, one of his young attendants entered and started pestering him with questions related to his business. At first, the man did not react, but continued to pray. But the lad would not relent, and, unable to restrain himself, the man finally answered the question, sharply. He immediately returned to his prayers, but the words came out clipped and garbled. The special feelings of holiness that he had previously felt had also disappeared. As soon as he realized this, hew felt greatly disturbed, but could not pinpoint the cause of the loss. He certainly did not attribute the change to that one sharp word he had spoken. He innocently thought that perhaps some letter in the tefillin had been erased, and decided to take them to a sofer for an examination. When the sofer opened the tefillin boxes, he and the wealthy man were astounded at what they saw. The klaf (parchment) of the tefillin was completely blank - the letters had flown away. Zechuso yagein Aleinu – May Rabbi Chaim ben Attar’s merits protect us all!